A bet on the Irish Lotto costs just £2 and you can take 2 more chances to win for just £1 extra. Draws are every Wednesday & Saturday and you can bet on the outcome and win all the same prizes at Lottoland. The main draw offers a minimum jackpot of at least £1.4M, with £900k available on the Plus 1 draw and £225k on the Plus 2 draw. That means you can take the chance to win 3 jackpots for just £3! The Irish Lotto draws take place every Wednesday and Saturday night at around 8pm (GMT). The odds of winning a prize on the Irish Lotto are just 1 in 29! 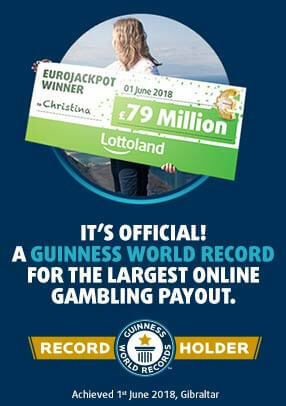 On top of this the actual jackpot odds (just over 1 in ten million) are also very reasonable compared to most other lottos. And, for £1 more, you can bet on the Plus 1 and Plus 2 draws boasting jackpots of £900k and £225k respectively!